This straightforward, non-technical commentary series aims to explain and apply God's Word, focusing on the major doctrines in each text and how they relate to the whole of Scripture. Clear outlines, a logical flow of thought and helpful scripture references will help make the Bible come alive for his people. 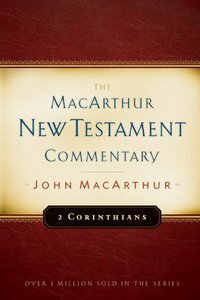 About "2 Corinthians (Macarthur New Testament Commentary Series)"
Next in the best-selling MacArthur New Testament Commentary Series. The Corinthian church required Paul's repeated care. In 2 Corinthians, he continues his attempt to correct errors of unchristian practice, worship, and doctrine. Concerned with false apostles who were leading the church astray, Paul defended his own authority as God's apostle and sought reconciliation within the church. Respected preacher and Bible teacher John MacArthur presents yet another comprehensive and compelling commentary in his New Testament series.^HIGHLIGHTS- Takes a verse-by-verse examination of 2 Corinthians, providing context, history, and background.- MacArthur New Testament Commentary series is quickly approaching one million copies sold. Paul's second letter to the Corinthians is the most personal of all his writings---a defense of his apostleship, which was under assault by false teachers. MacArthur focuses on themes of struggle and suffering---and restoration and reconciliation. His verse-by-verse approach is expository, doctrinal, and practical, making this an accessible resource for pastors and laypeople alike. Respected Bible teacher Dr John MacArthur has produced a non-technical commentary series that is clearly expressed, logically arranged, and focused on personal application. Dr Macarthur identifies the major doctrines in each New Testament book, and explains them not only in their particular context, but also in relation to the whole of Scripture. From Moody Press.